One of our current volunteer land crew hails from New York City. His name is Zach Williams, and he has been an invaluable member of the team over the last couple of months. His enthusiasm will be missed! Below are his thoughts on volunteering with Refugee Rescue. I found myself engrained in my keyboard warrior ways, I think most of us do. Most people are good people who care about others, and typing out your anger at the horrific situations we see online day in and day out is the most convenient way of letting others know that you care. But I wanted to do more; I wanted to provide tangible help to those in need. And thanks to a recommendation by a friend, I found Refugee Rescue. Within a day, I had perused the website, scanned my passport, and applied to travel to Skala Sikamineas for two weeks just 30 days before I flew out to the eastern Mediterranean. I had no idea what I was walking into before I left. I was actually quite nervous during the days leading up to my flight. I grappled with my inner dialogue, questioning if I was ready for the undertaking. I spoke no Greek, never volunteered abroad before, and never worked with or for people forced from their home. Would I be useful? Would I be able to handle it? Would I find a support network? 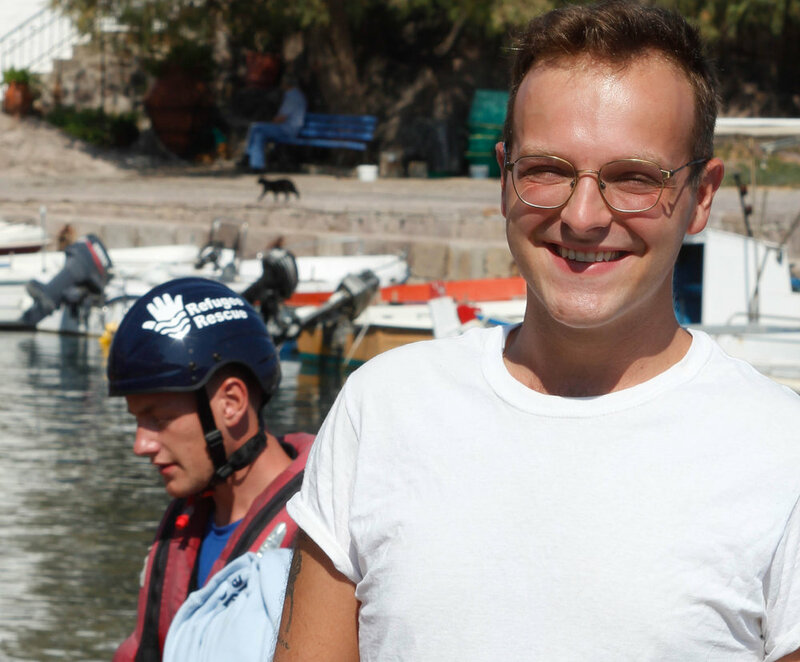 A spontaneous decision to apply to volunteer for the only remaining maritime Search & Rescue NGO left on the Northern shore of Lesbos, Greece, with little to no forethought had turned into a major point of anxiety. Go figure. But once I was here, all my fears vanished. Volunteering for Refugee Rescue surpassed every single expectation, tenfold. The Refugee Rescue team is, to put it simply, incredible. Both the sea crew and the land crew do everything in their power to provide rescue for those crossing the narrowest part of the Aegean Sea separating Turkey and Greece. An only 5-mile-wide strip of water acts as one of many hurdles these people cross in their journey fleeing violence, war and persecution. Working in the transit camp, called Stage 2, opened my eyes to the dire need of these people. It brings you back down to Earth. Buying a new sweater, getting the newest iPhone, needing a $5 Starbucks latte – it’s all inconsequential. Who am I to have such inane desires when there are people in this world who need food, water and shelter. This will always be in the back of mind from now on: food, water, shelter. Of all of the tasks Refugee Rescue volunteers complete, from spotting to distributing clothes at Stage 2 to helping with Lighthouse Relief’s ECO beach clean-up initiative, working up at Stage 2 is by far my favourite. There truly is something to be said for face-to-face contact with the people you are helping, although every single shift the volunteers have is immensely important to the success of our operations. My most vivid memory of Stage 2 starts with our busiest night of the summer. A boat had arrived in the morning with 53 people aboard. The transport to Stage 2 and the clothes distribution went smoothly, when all of a sudden, we were notified that another 48 people are being transferred to us from the East and would be arriving within the hour. With 101 people in Stage 2, the camp was at capacity. On top of that, the majority of the arrivals were children. A fellow volunteer and I were tasked with keeping the kids busy. We set up an art station, complete with coloured pencils, paper, and colouring books. I was worried though, we had a lot of young boys around the age of 11-13 who were in a desperate search for a football – I didn’t know how interested they would be in colouring. I was pleasantly surprised, however, when the group of rambunctious boys came running over and sat right down next to me. I started to draw a peaceful scene of a beach sunset. I noticed that the ringleader of the crew, a small but charismatic boy who loved high-fives, was copying my every move on his own paper. We continued in this way, joking and laughing the entire time. He drew the moon, pointed to the bright circle in the sky above us, and taught me the Farsi word for our nightly celestial being. He then asked for my name. I told him, “Zach.” He tried to spell it, coming up with “Zeek.” I wrote my name down next to his interpretation, and with glee he rushed to write his down next to mine, “Halit.” I stuck out my hand, offering a handshake, and said “It’s very nice to meet you, Halit.” He grabbed my hand, and voraciously shook it up and down for a good 5 seconds, grinning the whole time. When it was time to pack away the art supplies and get settled in for the night, Halit collected all his drawings and ran over to me. “For you!” he said smiling at me. Touched by the generous offer, I grabbed my beach sunset off the table, thanked him profusely for the gift and insisted he take mine with him. I still have Halit’s drawings with me, protected in a folder in my suitcase to ensure they safety on my trip back home. It’s astounding what basic human kindness can do. I will never forget Halit, his award-winning smile, and his ability to command a group of kids at a towering height barely hitting my waist. This experience has changed my life in many ways, most importantly it has sparked a fire within me to continue this work. I had to watch while Halit, his family, and the people he crossed the sea with were bused in the morning from Stage 2 to Moria. The permanent settlement of Moria is unimaginably overcrowded, filled with violence, and plagued by public health crises. And I had to watch while Halit was sent there. I cannot sit in my own satisfaction of making a child smile, I need to continue to put my time, effort, and resources into work like this – work that will hopefully address the horrors of places like Moria with public health solutions and policy to ensure freedom of movement for all those forced from their homes. I’ll end with my mother’s number one rule in our house growing up, “Being nice matters.” After my time in Lesbos with the remarkable Refugee Rescue team, I’ll alter it slightly: giving a damn matters.